Film Format: 4 x 5"
4 x 5" 5 x 7"
This item is one box of 100 sheets of 4 x 5" film. Box Dimensions (LxWxH) 6.0 x 4.7 x 1.5"
Delta 100 Professional Black and White Negative Film (4 x 5", 100 Sheets) is rated 4.7 out of 5 by 27. Rated 5 out of 5 by K D from Great! I've had problems with ordering through other websites, but B&H always ships my items well-wrapped and undamaged. They take excellent care with their products and ship them in a timely fashion. What I love about this specific item is the great tonal quality I get. It lasts and doesn't fade. The paper is durable and flawless! Rated 4 out of 5 by Anonymous from Good Film I shoot landscapes and nature. I find this film is good at rendering shadows and retaining highlights. It under normal processing the grain is very fine. under push/pull processing at 2 stops variation I notice grain starts to build up. Also, I notice it scratches easily. I tray process, so I am sure that is part of the reason; however I do notice more scratches in this film compared to their yellow box competitor. Rated 5 out of 5 by Anonymous from Great Film I am a student and have been using HP5 and FP4 for a while. I switched to Delta 100 and am not disappointed. While it is a slower film the difference is very noticeable in the negatives. I am currently using this film in a Sinar F1. Rated 5 out of 5 by Anonymous from absolutely gorgeous I have never loved a film as much as I love this one. Beautiful tonal scale, great for expansion and contraction. I use it for 4x5, 120, and 35mm. Rated 5 out of 5 by Harley from My favorite LF film When it comes to detail and fine grain, this is what I turn to. It has consistently high acutance and a lovely dynamic range. Rated 4 out of 5 by Anouk Michelle from Sharp, graceful...fragile This is the first time I've used Delta 100. It seems like the emulsion is much more fragile than FP4, but it's certainly sharper. Highlights have a tendency to blow-out in high-contrast situations, but it responds really sensitively to development adjustments so it's not such a big deal. Definitely harder to use than FP4, but the difference in sharpness, grain, and graceful contrast makes it worth it. Rated 5 out of 5 by Anonymous from Excellent tonality I shoot a healthy mix of landscape, architecture and fashion in 4x5 and 8x10. I like the tonal range and 3-D look this film generates for contact prints and its compatibility with a wide range of developers. 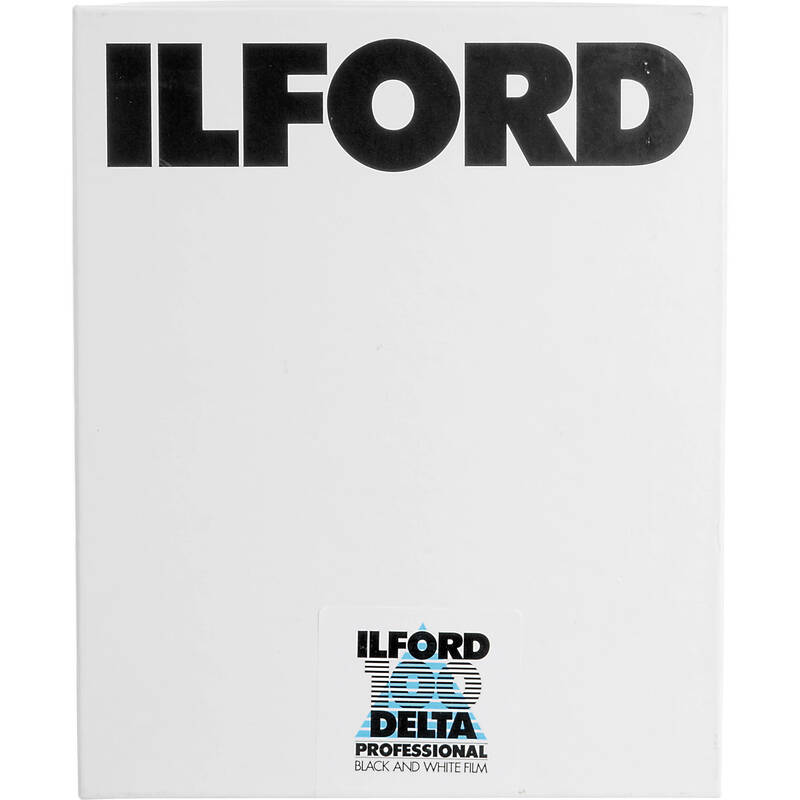 My favorite combo is Ilford DeltaPro 100 with D-76 1:1 and H-110 1:100. I also like the generally forgiving nature and ability to push/pull. Rated 5 out of 5 by outta clemson from nice I'm processing it in D76 1:1 and getting very good results. It is very fine grained film. I've just shot about 300 sheets of it, and have used HP5, FP4, TriX, PlusX, and a ton of AgfaPan 100 in the past. I must say I'm pretty happy, and was a bit surprised, because I was never a TMax fan. Going to shoot some more. When does this film expire?